Nothing captures the spirit of a day at the beach in Mexico like the fresh seafood cocktail or ceviche. But you don't have to be on the coast to enjoy it. Rick finds a classic version at a favorite spot with the feel of a beachside fish shack -- right in the heart of landlocked Mexico City. 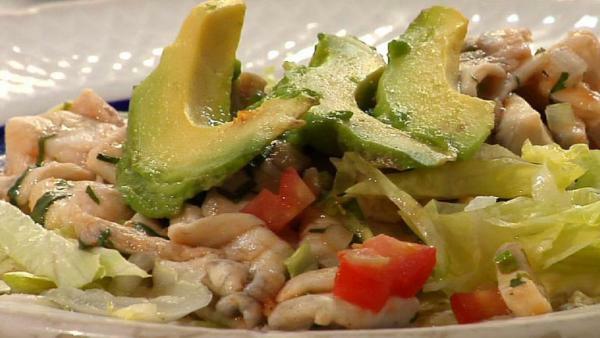 Then, in search of more "inland ceviche" surprises, he hits the streets and takes us to a major-league marisqueria with a menu to rival any great seafood restaurant in town -- all created in a stand no larger than a fishing boat. Rick enjoys the bracing blend of octopus, fish, shrimp and hot sauce known as Vuelve a la Vida ("Come Back to Life," so named because it's a popular a hangover cure). At a nearby fish market, he checks out the catch of the day from both the Pacific and Gulf coasts, and shares tips on the best choices for homemade ceviche. In Chicago, he makes a quick Frontera ceviche, a preparation that's been a mainstay at his Frontera Grill for years. Then we're off to Fishmart, a casual Mexico City seafood place, for a taste of what just might be the next hot trend in cold seafood: aguachile. It's a classic way to serve fresh shrimp and scallops with modern minimalist appeal -- simply laying them on a plate and sprinkling them with lime juice, salt and fresh jalapenos. In his home kitchen, Rick recreates his version of Shrimp en Aguachile in a matter of minutes. Then it's on to the one of Mexico City's splashiest seafood hotspots, Contramar, to see how they dress up their traditional Ceviche Especial in a strikingly modern presentation. And that inspires Rick to take us behind the scenes at his fine-dining restaurant, Topolobampo, for one last inland ceviche recipe: his inventive, surprisingly easy Herb Green Ceviche. It's a mouthwatering fishing expedition that brings home the pleasures of ceviche -- even when you're nowhere near the shore. Rick finds a classic version of ceviche at a favorite spot with the feel of a beachside fish shack -- right in the heart of landlocked Mexico City. This recipe has been a mainstay at Rick's Frontera Grill in Chicago for years. This dish is a mouthwatering fishing expedition that brings home the pleasures of ceviche -- even when you're nowhere near the shore. Rick recreates his version of Shrimp en Aguachile in a matter of minutes.